Firstly, apologies to my fellow bakers for waiting until the 2nd of June to get this post up! I've been a little under the weather over the past couple of days, so today was the first chance I've had to get down to business. As a special side note, I'd also like to wish my parents a very, very Happy 39th (yes, 39th!) Anniversary! Incredible, right? But without further ado, welcome to another wonderful month of Miettes! 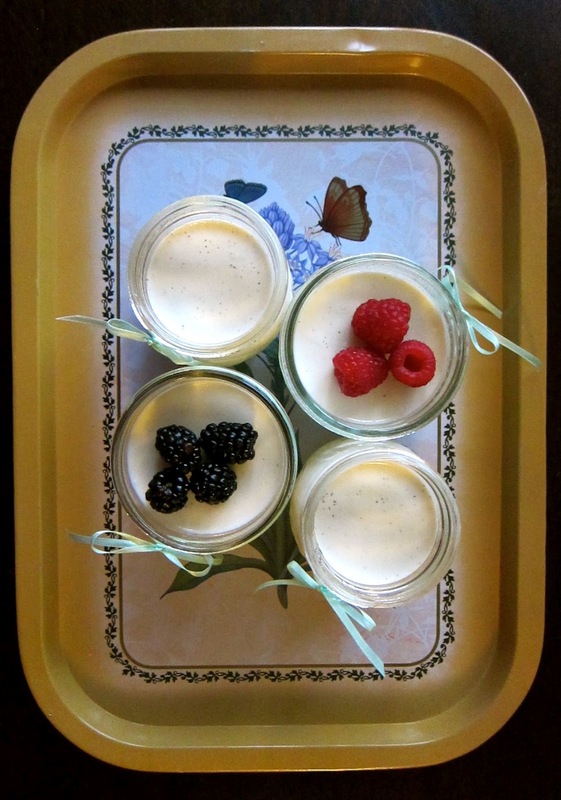 This month we tackled Buttermilk Panna Cotta and another wonderful round of wonderful, talented bloggers have joined me. Wonderful! I'm always so grateful to be in such excellent company, and to be testing these recipes alongside such gifted bakers. Athena's photography never ceases to inspire. 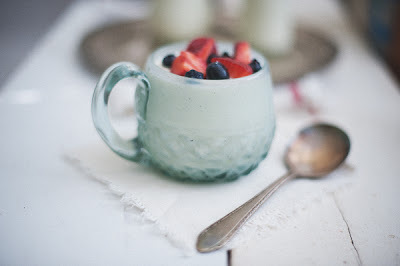 She served her panna cotta up in a variety of dishes, including this wistful, turquoise mug topped with fresh berries. 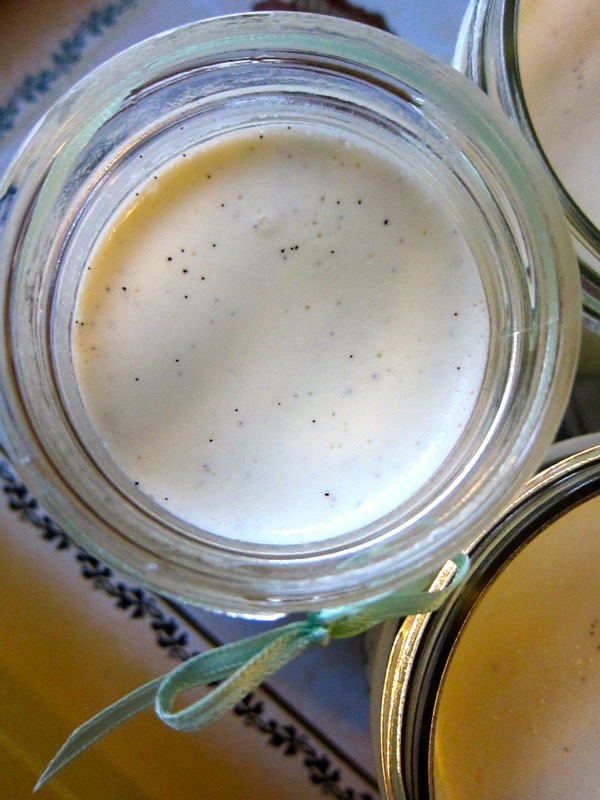 I love her line about vanilla bean being one of life's simple pleasures. I couldn't agree more! And there is something so soothing about her photos, don't you think? Check out her post on her website Athena Plichta Photography. Deb was tangled up in blue this month with her blueberry-topped panna cottas. She added some gorgeous, blue fabrics and accessories to complement them. I just love the rich, creamy yellow in these photos. Doesn't it make you want to dive right in? You can view Deb's full post on her blog, East of Eden Cooking. Jasmine of Cook That Book - with whom I seem to spend more time in the kitchen than anyone else (virtually, of course! 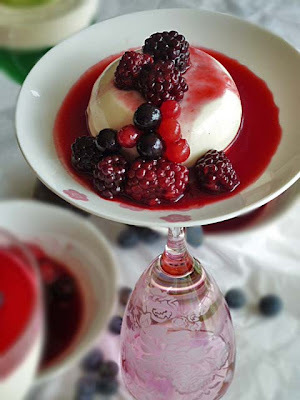 ), as we also cook together for Food & Wine Covers and often bake together for Muffin Monday - writes about her experience with the gelatin ratios in this recipe, and how she's looking forward to making panna cotta again... though she's still hunting for that perfect recipe. In the meantime, her creations look so inviting in those snifter glasses and atop that summery gingham! 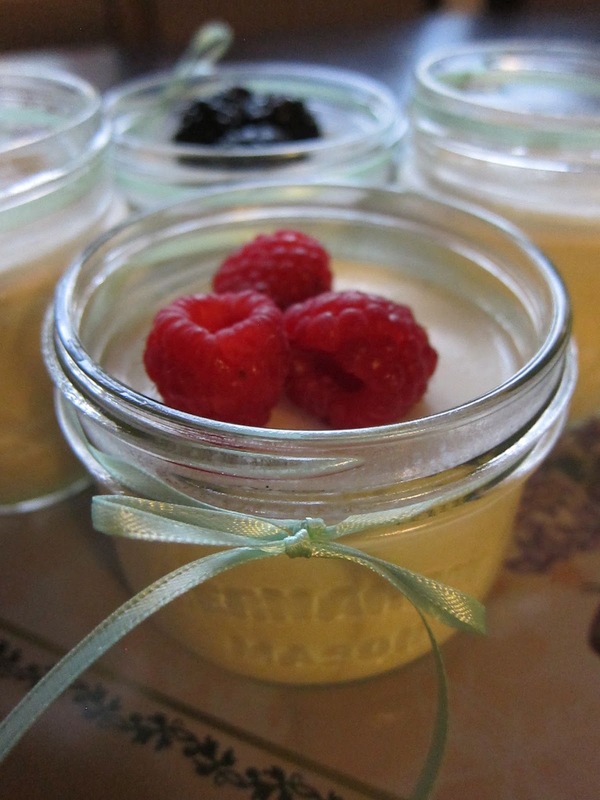 Jing has made Miette's Panna Cottas three times over! That's commitment! She has tried a whole slew of different toppings, too, from strawberries and mango, to peach and green tangerine. 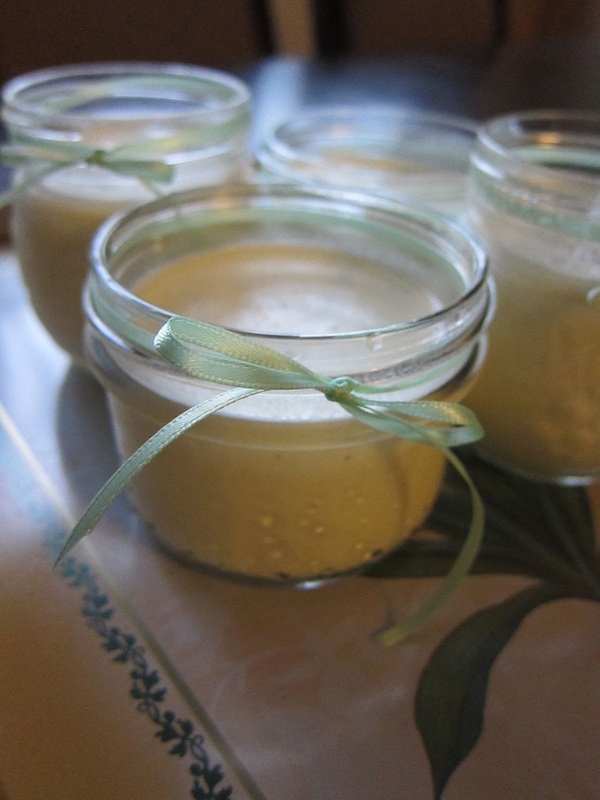 You can also read about her experience with gelatin over on her Miette-focussed blog Me-ette. Love those pretty punches of colour on top! Such sweet styling. Lin, my lovely friend across the pond (and panna cotta-making vet! ), joined us this month for the first time. Check out the variety of flavours that she came up with (including using lime jelly - yum! ), along with her clever presentation on her blog Lin's Food. Welcome, Lin! Lyle & Laura of Creative Gourmet Inc. were brave and tried experimenting with some of their favourite liqueurs and flavours! Chambord, Kahlua, Cocoa... they sounded to me like matches made in heavenly places. Things aren't always as they seem, however! Read about their experience and who had to grin and bear it in the end! Not to be missed! Though she wasn't able to join us this month, my lovely friend Kathy of Eat Halifax joined us just after the fact in April, with these beautiful lemon tarts. 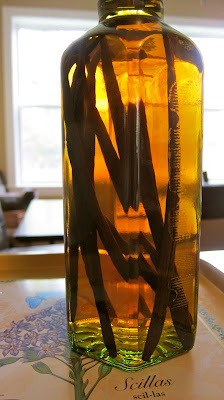 I started making homemade vanilla extract at the beginning of March, so this was actually the very first time I dared to open the bottle and use the treasures inside! Back then, I had gotten 8 Madagascar Vanilla Beans from the wonderful Costas, who sells Épices de Cru at the Brewery Market in Halifax. He sells 8 of his vanilla beans for just $10, which is truly an incredible deal. I knew I had to do something special with them, but while I was figuring out what that would be, I thought it would be wise to preserve them. And how genius is homemade vanilla extract for that kind of multi-tasking? Pop those beans in a 40 of rum and you're good to go, you just need a little patience. While waiting for the milk and vanilla bean scrapings to boil for the panna cotta, I allowed the sectioned off pod to sit in the liquid, too, in order to squeeze out as much vanilla flavour as I could. I then fished it out right before adding the gelatin mixture. My panna cottas set perfectly, but make no mistake: this was not intentional! It was sheer luck. Being a gelatin novice, I accidentally put an entire packet in, misreading the instructions on the package. It only occurred to me after the fact, thankfully, or I might have thrown the whole lot out! Also, I made them in the morning, and didn't get a chance to enjoy them until the following day in the evening (saving one for breakfast the next day, of course! ), so they were setting for about 36 hours before ever seeing the light of day. Had I let them set in more practical jars or bowls, they definitely could have been unmoulded. I have some theories. Did anyone else use small enough containers to make 16 servings, as the recipe suggests? For me, I could only fill 2 small and 2 small, wide-mouth mason jars, with no liquid left over. My guess is that Meg used teeny, tiny little pots (in order to get 16 servings), which would lend to her 'smaller is better' - Miette - way of doing things. It's likely that these little pots set perfectly overnight, but any bigger (like many of us used), and you'd probably need much more time, or much more gelatin, to make it set. I wish I could say there was something intentional or strategic about the way I made my panna cotta, but after seeing the results, and then reading about some others' difficulties having their panna cotta set, this is the only way I could make sense of it. Granted, I have no idea how long everyone else let theirs set. So what do you think? When using gelatin, should the size of container matter if the formula is correct? A little bit of gelatin did accumulate at the bottom of my jars, and having so little experience with it, I didn't know whether that was normal or whether it was because I did, in fact, use too much gelatin in the first place. Set or not, I think everyone agreed that the flavour and creaminess of Miette's panna cotta was to die for. I was tempted to eat them without garnish of any kind, not wanting to cover up those sweet speckles of vanilla bean sprinkled over their tops! In the end, I opted for a little bundle of raspberries and blackberries to go along with them. It's time to step it up a notch, friends! June's challenge is PARISIAN MACARONS on page 145. If you're anything like me, it's the day that you've been both wildly anticipating and dreading all at the same time! This will be my very first time attempting to make macarons at home, so wish me luck. There are plenty of variations, too: You can choose from Lemon, Grapefruit, Rose Geranium, Pistachio, Coffee, Hazelnut, Chocolate, or Chocolate-Orange. Or, if you're feeling particularly brave, dream up your own flavour combination! 1) Buy Miette. It will be the prettiest, daintiest addition to your kitchen/bookshelf. 2) Bake the challenge of the month and post about it on your blog/website by the 25th. Our challenge for June is the Parisian Macaron - due June 25th, 2012. 3) Grab a macaron or two for breakfast (as often or as seldom as you wish, but at least once! ), photograph it, and enjoy this little morning ritual to the fullest. Leave me a comment below if you would like to participate and/or if your post is up! Oh. Just oh. 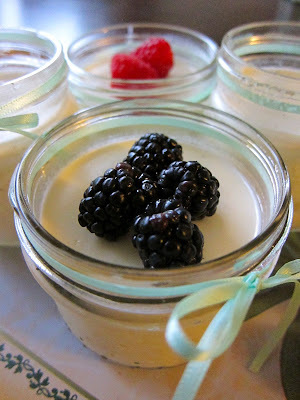 All of that rich panna cotta smoothness is making me lonnnnnnnnng to wrap a spoon around that silky splendour. Yum, yum and yum. 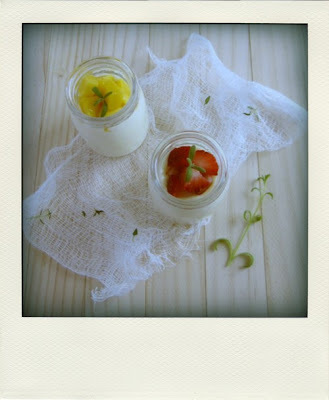 All of you should be incredibly proud, not only of your desserts but by your very beautiful photographs. A few key things about gelatin - make sure all the granules are fully dissolved, don't boil the mixture otherwise the gelatin might lose its efficacy, it's best to chill the desserts for 24 hours(it won't further set after that). During my first two attempts, I didn't check to make sure all the gelatin granules had been dissolved, which may be why I ended up getting cream soup. The post also mentioned that "1 envelope(about 2 1/4 to 2 1/2 teaspoons) of gelatin will softly set 3 cups of liquid. You will not be able to unmold this type of dessert." 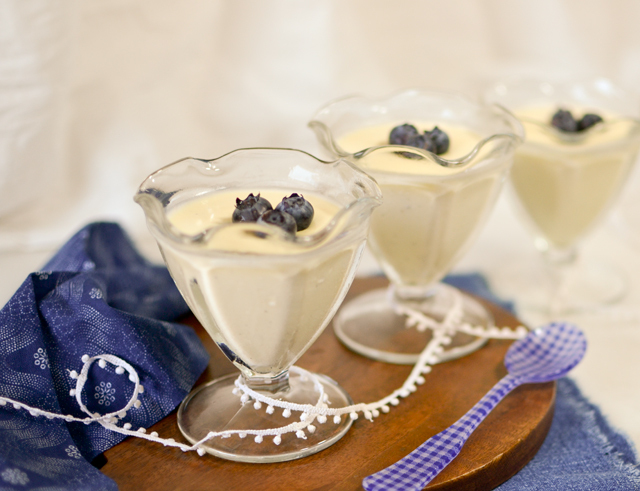 Miette's recipe asks for only 1 teaspoon of gelatin for 3 cups & 2 tablespoons of liquid. 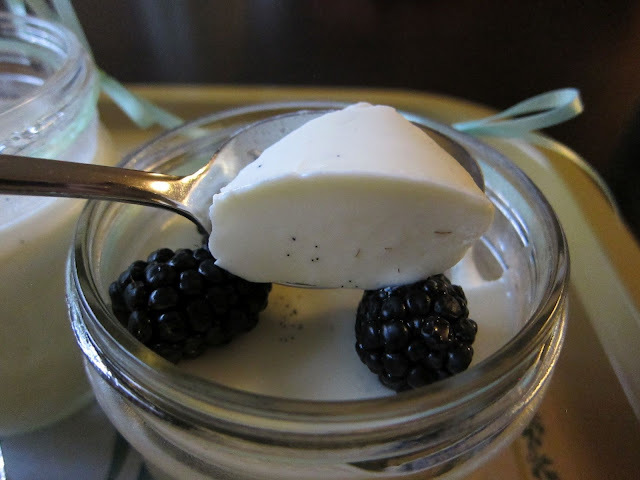 Maybe it's how panna cotta should be like by Miette standard? 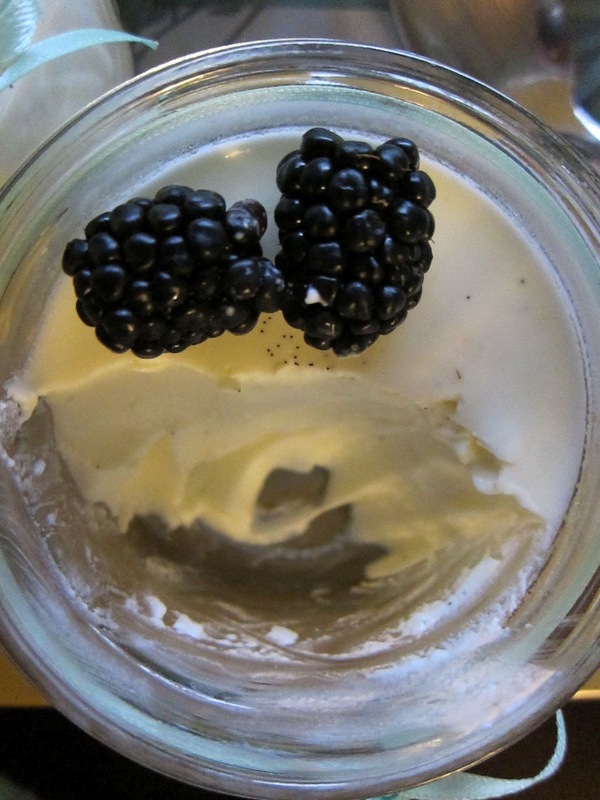 I made mine in a few 2-ounce jars and a few bigger jelly moulds, the texture seems to be the same for both - just slightly thicker than greek yogurt. I LOVED Miette's macarons! Especially the pistachio one. So good! Can't wait to make some myself! 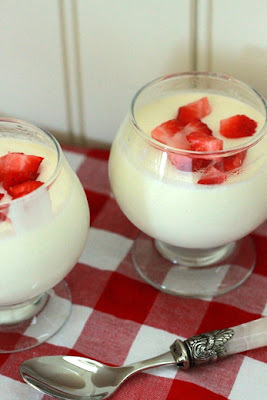 Your panna cotta looks amazing! Everyone's do. I will definitely be going back and making my own at some point. I wish I had learned about your wonderful monthly Miettes sooner ;) So excited to be a part of this month's though! And frightened a little too. I've made macarons before however I've only had 1 success of the 3 times I've made them. They last time was utter disaster. Hoping I can pull this off for my monthly Miettes debut! Thanks for hosting Monthly Miettes! I enjoyed making the Panna Cotta, it was easy and delicious! I calculated a total of 26 fluid ounces of liquid in the recipe, which equals 13, 2 ounce portions. Unfortunately 2 ounces is a tiny serving for such a scrumptious dessert! I portioned mine by the containers I used, rather than serving size!